I’m really thrilled that I can say that Leslie Muir is here today. We’re friends, you see, from long ago (as you will read way down below). Leslie didn’t blink. Now I’m hoping you’ll enjoy our rhyme. then rang my agent on the phone! My tiny whoop became a SQUEEEEAL!!! Did your title ever change? Your plot? Your words? The cast? The tone? Or did you shout "Leave this alone!"? so many times my brains are fried. around the bend and back again. I loved my title, it was true. *Explanation: My original title for the story was The Wee Patisserie. The sales and marketing team at my publishing house felt that my Frenchy title might not jump out to buyers, especially those unfamiliar with the word patisserie. In the end, I deferred to their expertise. I’m usually open to changes during the revision process, but I was very attached to the original title and hated to lose it. It’s all good though. **And for the record: I took poetic license with the Valium line! Any story into picture book form at all as you need to keep the story front and center without letting people even think about the writing, and you do it so effectively without forcing word choice or story points or... uh... uh... using slime. or you’ll waste a ton of time. a bump in rhythm is like a blood curdling, really distracting SCREAM. See? I told you. **I really did eat a pound of Halloween candy. So quickly, please... what's next for you? C. R. MUDGEON is out real soon! You smell nice, you seldom... stinkus. 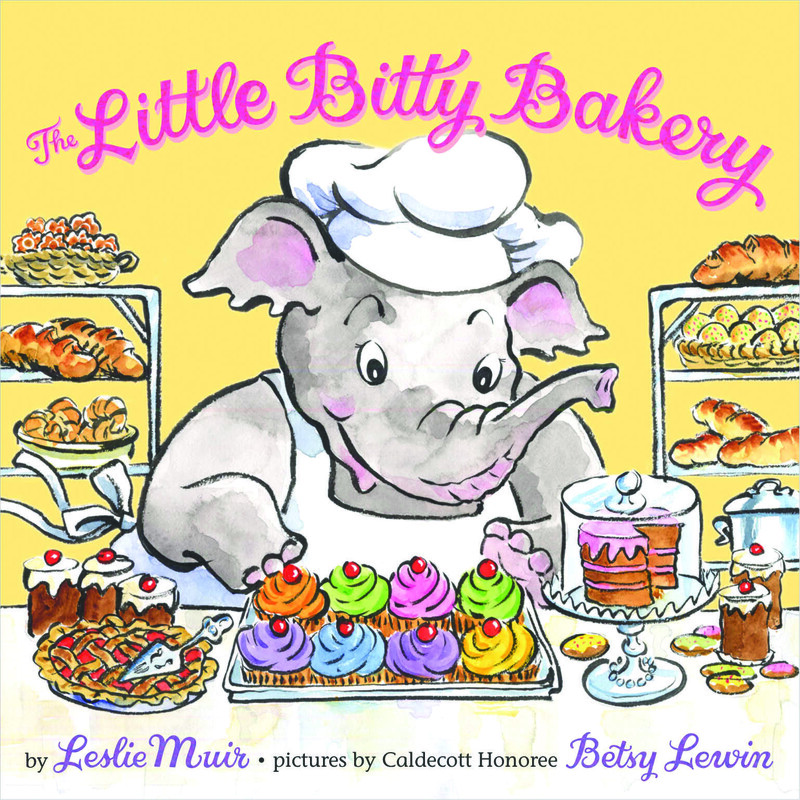 Leslie Muir's newest book, The Little Bitty Bakery (Disney/Hyperion), is a sweet, sweet story with fabulous illustrations by Betsy Lewin. It's a treat to read aloud, and it's a filling confection any time of day. But my excitement with having her here goes deeper than that. You see, Leslie and I were in the same online, rhyme only critique group (an exceedingly talented bunch, I must add) back before either of us had sold anything at all. Leslie always blew me away with her poems, picture book manuscripts, and her notes on others' work, too. 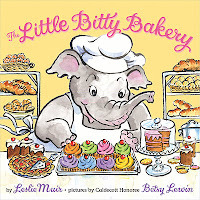 Our critique group broke up years ago, but flash forward to 2011 and Leslie has THREE picture books out (Barry B. Wary and Gibbus Moony Wants to Bite You being the others) with C.R. Mudgeon coming next year. The success is no surprise to me, and if you'd seen her work back when I first saw it, it'd be no surprise to you, either. I'm only stop two on Leslie Muir and Betsy Lewin's blog tour, so there's more good reading out there. 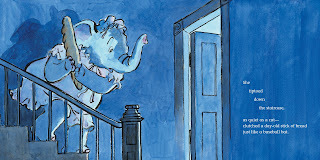 In fact, yesterday, Jules had a fabulous post (full o' art and more) over at Seven Impossible Things Before Breakfast. Tomorrow, the tour moves to Jama Kim Rattigan's always appetizing Jama's Alphabet Soup. And Friday, the crew stops over at the ever-entertaining Elizabeth Dulemba's blog. I hope you'll check 'em all out. And my thanks again to Leslie for being here and not even blinking when I said "wacky idea - let's do a Q&A in rhyme." That's friendship (and bravery!). Thanks for hosting me on your kick-arse blog, Greg. You rock. Only you, Greg, could actually get across CONTENT in a rhyme scheme. Leslie pretty much rocked the house, too. I'm not going to try and do a Winter Blog Blast interview like this, though. Tanita, I think you should absolutely do all future interviews this way. So should CNN, for that matter. And Leslie - it was my pleasure. I selfishly like how you make my blog look good: I lob questions, you have to be clever. I could get used to that. Plus, ya know, I love your books! Brilliant! Mr. Pincus doesn't stinkus :D.
Oh, I am not worthy . . . Brilliant. You guys are brave. That was full of snort-laugh-worthy moments. I shouldn't have been drinking coffee while reading. Aw shucks, thanks guys. Greg is the seldom stinky mastermind. Can't get this book out of my head! This was freakin' aMAzing!! You guys rock!! I second what Tanita said (and what Leslie said, too, actually): you put the content in first, and then the rhyme! Brilliant! Poets should be made to do tricks more often. You guys are party pleasers. Awesome! I'm feeling all Zorgamazoo just reading that. Look forward to checking out your books, Leslie. Thanks again, ONE AND ALL. I appreciate all the kind words. 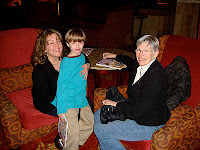 Kerry--So glad to hear you and your girls like the book! And Catherine--I feel Zorgamazoo too after reading your comment! This interview was really fun! we ever see that's all in rhyme. her clever rhyming has allure! Great job! Creative. Love it. This was BEYOND awesome! Love it. to write these fab rhymes for GottaBook. And Cathrine...Zorgamazoo? Great word! Who came up with it--you? I second Leslie's thanks to all (and poetic thanks to Barbara Jean and Laurie for verse responses!). And April, Zorgamazoo is a novel by Robert Paul Weston (from 2008) written completely in rhymed couplets. It's well worth a read not only because it's tremendous, Seussian fun, but also to celebrate the fact that it exists. This blog was fabulous! And oh, how it made me miss you both, and our group. I got that tingy, up-the-spine-feeling while reading,just like when I read Leslie's work back in the day! See you in Spokane? Or...?